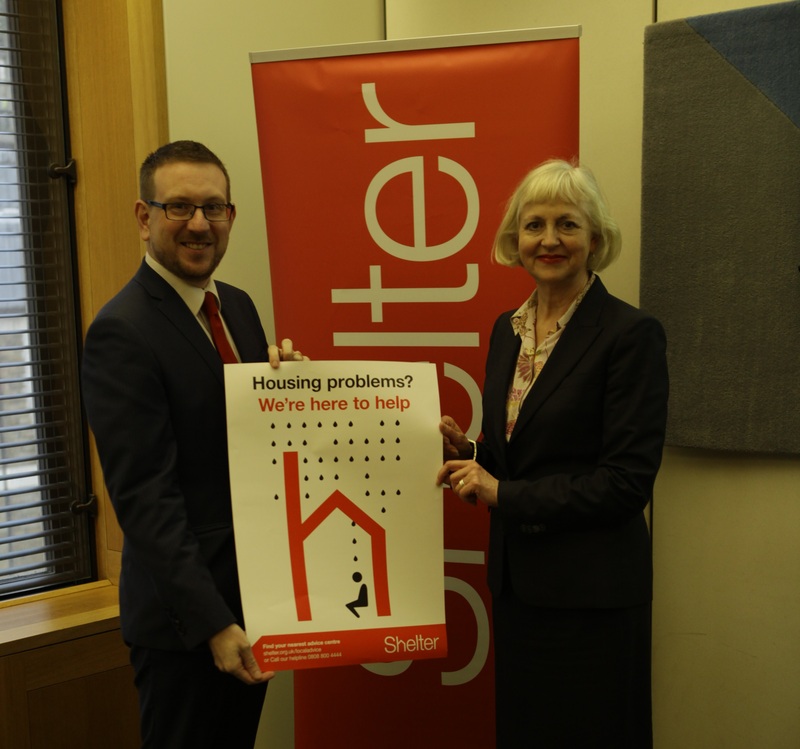 Andrew Gwynne MP showed his support for people fighting bad housing and homelessness in Tameside and Stockport this week, when he attended the launch of Shelter’s new campaign to raise awareness of its vital advice and support services. Andrew attended the event on Tuesday 5th January where he met with Shelter’s Director of Services Alison Mohammed to discuss the frontline services Shelter delivers in the local area, and across the UK. These include the 206 cases that Shelter dealt with in the Stockport area last year alone. Prompted by a new Shelter and YouGov survey, the event highlighted the strain families face in the North West in January, with one in eight rent or mortgage payers fearing they will be unable to meet their housing costs this month. At the same time 17% of people in the region are cutting back on winter fuel and clothing to meet their housing payments – the equivalent of 960,000 people. Andrew and Shelter are urging anyone who is struggling with their housing costs to seek advice, before problems spiral out of control. Shelter, the leading housing and homelessness charity, helps over 4 million people a year with free, practical housing advice, through its online support, face to face and national helpline services. “Shelter’s frontline services provide invaluable assistance to many of Denton and Reddish’ residents, particularly at what can be an extremely tough time of year. They can often be the difference between a family staying in their home or becoming homeless. “I know from my regular surgeries that it is absolutely critical people who are struggling to stay in their homes seek help at the earliest opportunity. I would urge anyone who is having difficulty making their rent or mortgage payments to contact Shelter, or myself, as soon as they can. “Every day at Shelter we hear from families who face the bleak choice between missing their rent or cutting back on heating. Or from parents whose children have stopped asking for treats because they know they’re struggling just to keep a roof over their heads.